This is a total copy of Marcus Wareing’s extremely fine http://www.greatbritishchefs.com/recipes/feta-olive-muffins-recipe and no originality is claimed, hard to improve on perfection. Mix flour, grated cheese, baking powder, salt and pepper. Stir in milk, oil, chopped olives, herbs and everything else apart from the feta and cream cheese. Separately, mix the cream cheese with a little milk, crumble in the feta and mix to make a lumpy paste. Half-fill each hole of a muffin tin with the muffin mix, add a teaspoon of the feta mix, then top up with muffin mix. 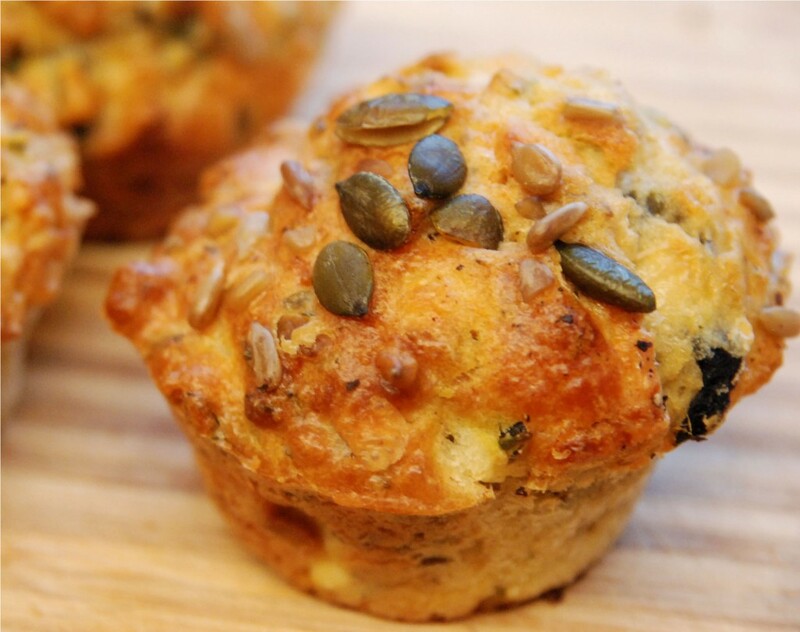 Sprinkle a few pumpkin seeds and sunflower kernels on top. Bake 20 mins at 170C, cooling in the tin.